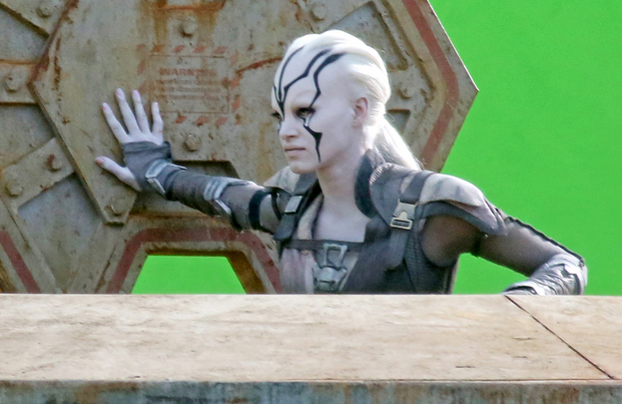 The latest photos from the set of Star Trek Beyond have raised just as much interest into Chris Pine's Kirk wardrobe as they have into the background of Sophie Boutella's pale-faced character. The recent images have again come from what appears to be a crash-landed starship and has Pine, Boutella, Chekov actor Anton Yelchin and writer/Scotty actor Simon Pegg emerging from the wreckage. Whether the Kingsman actress' character is a friend or foe has still to be revealed but here it does look as though she is assisting the Starfleet officers. Is she doing this willingly? 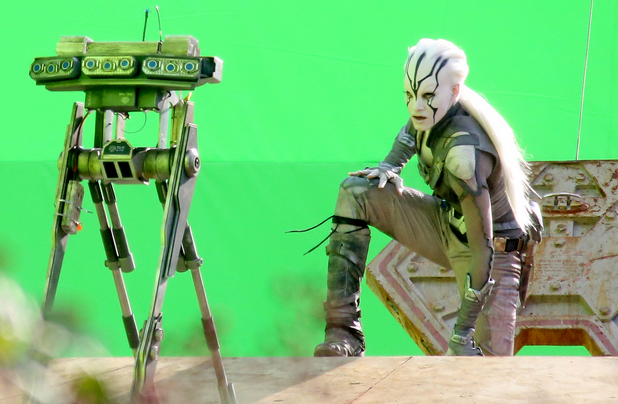 Is Boutella some sort of mercenary as might be construed from the leather-effect attire? Maybe not but hey, this is only a photo from one moment of one day of shooting so we can conjecture as much as we want and still be miles away. Talking of cast briefly, there was also the addition of Lydia Wilson announced last week. Known for About Time as well as Ripper Street and Misfits, she's joined in an as-yet unknown role. While it's great to see new faces as part of the franchise we do know that Joseph Gatt will not be returning as Science Officer 0718 (even though IMDB lists him on the cast). Apparently he was in it and then the role was cut out. So too it seems we won't be getting the return of Alice Eve as Carol Marcus unless she's showing up for a brief cameo or later in filming that we don't yet know about. Bit of a shame since there was a fairly big thing made of her joining the crew for the five year mission at the end of Into Darkness. Guess that also means that Lin will need to find someone else to undress to their pants this time round. 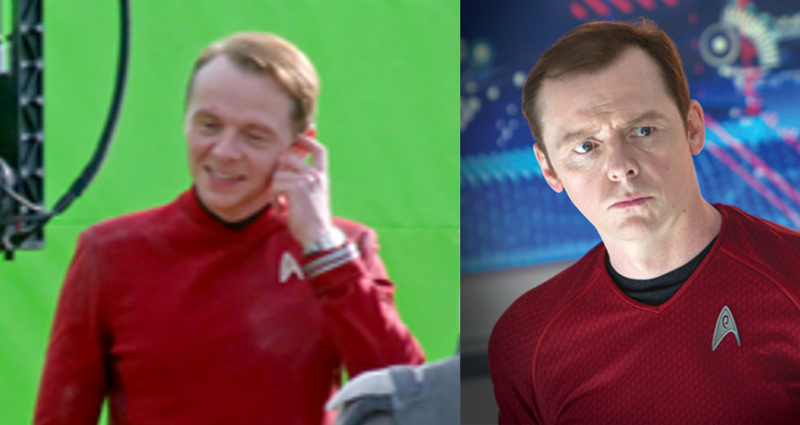 Anyone else also noticed that Pegg's Starfleet uniform seems subtlety different to the one he's worn in 2009 and Into Darkness? T|he collar shape has definitely altered and I cant make out if the uniform is still adorned with those tiny Starfleet deltas however that might just be down to distance. The collar is certainly thicker and more defined with the seams also adjusted. Is it me or is the shade of red somewhat, well, redder and shinier too? Take a look at this comparison shot from Into Darkness and judge for yourself but I certainly think there's been some changes. I personally felt that the previous version was a bit too casual and the neckline too low with black undershirts rather than collars as per The Original Series. Of course this might be some form of away mission shirt which will blow my theory right out of the water (apologies for image quality - had to be cropped). Now going back to the start of all the Beyond hype kick-off, director Justin Lin tweeted that image of the Starfleet emblem. It now seems that the badge was attached to the jacket that Kirk is wearing in the scenes being filmed here. Starfleet jackets seem to have become a "thing" with the reboots as we had cadet jackets in the 2009 movie, the more formal dress greys complete with caps (very military) in Into Darkness and now these blue options worn by Kirk and Chekov. They may well be away team attire (why isn't Scotty wearing the same?!) or they could be a formal variant but again, conjecture conjecture conjecture. I like the look of it but it would have been cool if this was a captain's variant perhaps just for Kirk akin to his season one and two wraparounds from The Original Series or perhaps more in line with the super-cool Picard leather and suede combo from The Next Generation designed by Robert Blackman. That was hands down my favourite but given the cost from Anovos I doubt I'll ever get to own it! Sisko obviously wasn't important enough to get his own version and had to do with a two piece version of the First Contact grey/black which could open up jacket-stylee. 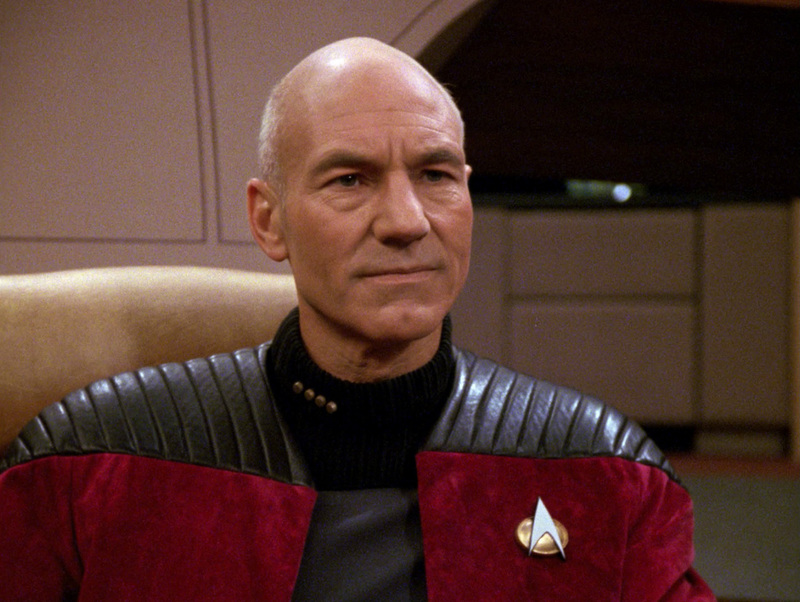 However, he did get to rock the captain's waistcoat with full threatening potential on more than one occasion. Janeway didn't get anything sadly aside from the odd Die Hard vest moment (Macrocosm) and Archer's bomber jacket very rarely made an outing as the NX-01 crew were firmly restricted to their combat flight-suit uniforms. If we go back to basics though fans will recall that an away team uniform - nay jacket - has been there since the very beginning. Right back in The Cage, Pike's crew are kitted out in some very plain and simple grey jackets designed by the legendary Bill Theiss. So simple that there's no ship emblem or anything to distinguish the Enterprise officers. 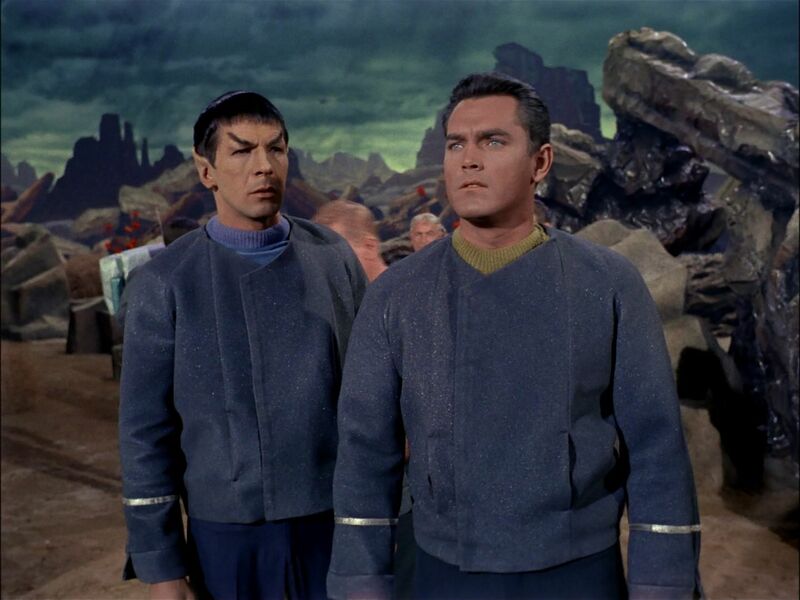 The concept was never carried forward to The Original Series and it remains one of those lovely lost bits of Star Trek which it seems has now oddly come full circle! Looking back to the previous two movies as well it is apparent that the away team gear has been redesigned for a third time (if you count the atmosphere suits in 2009) abandoning the skin-tight jumpsuits that were seen in the opening sequence of Into Darkness in favour of something a little more flattering for the cast. I can't imagine they were all too thrilled with their websuits. 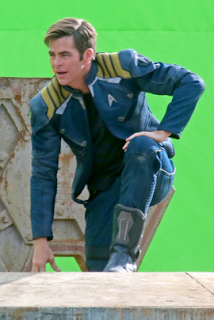 The new blues, which also feature gold shoulder detailing and that previously seen Starfleet patch on the arm. They do appear more hard-wearing Starfleet issue especially when combined with the boots we can see Pine and Yelchin wearing here. I suspect that given the near-release of the Costumes book from Titan these won't be featured (grumpy face). What I think I can say is that the piping on the shoulder does reflect division since both are gold. Think I'm right? It also suggests Chekov will be sticking with the command division and not being pedalled off into Engineering to don a redshirt. Certainly we're looking at some part of a major action sequence here but exactly what just can't be guessed. Interesting to see, certainly but we've been disappointed before - need I remind us all of the great sneak pics from Into Darkness and how that turned out in the end. 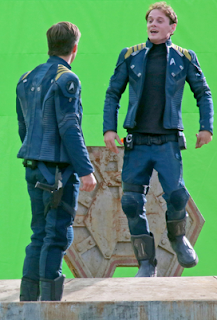 This pic does also give us a chance to see the movie's phaser design (seems unchanged) and also the communicator hanging from Yelchin's clip belt. The other item might be a communicator but we haven't had a good enough angle to confirm. The full set of pictures can be seen via ScreenCrush. Some have been reproduced here as part of this article. What are your thoughts on these new pics? What do you think it suggests about Star Trek Beyond? We're also live on YOUTUBE with selected reviews and articles to complement this site! What do you want to see on there?